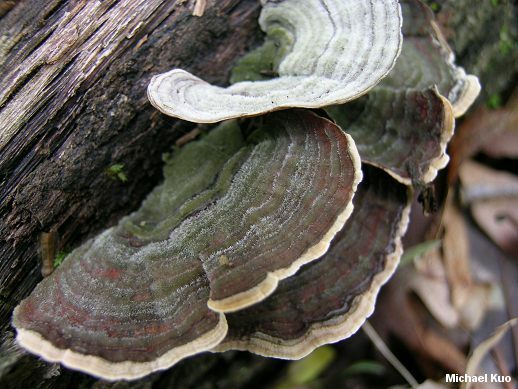 Stereum ostrea is often called the "False Turkey Tail," since it mimics Trametes versicolor. 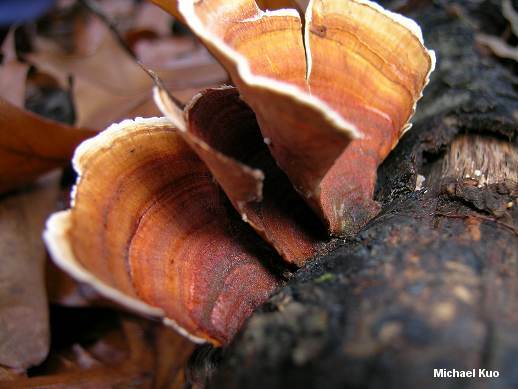 Like the "true" Turkey Tail, Stereum ostrea has a colorful, somewhat fuzzy cap that displays zones of brown, red, orange, buff, and green colors. While it might be said that Stereum ostrea is more red, more of the time, the tell-tale difference between true and false Turkey Tails is found underneath the cap: Stereum ostrea lacks a pore surface, and therefore has a smooth underside. 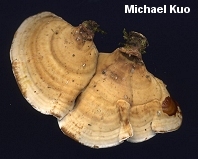 In other words, it is a crust fungus rather than a polypore. 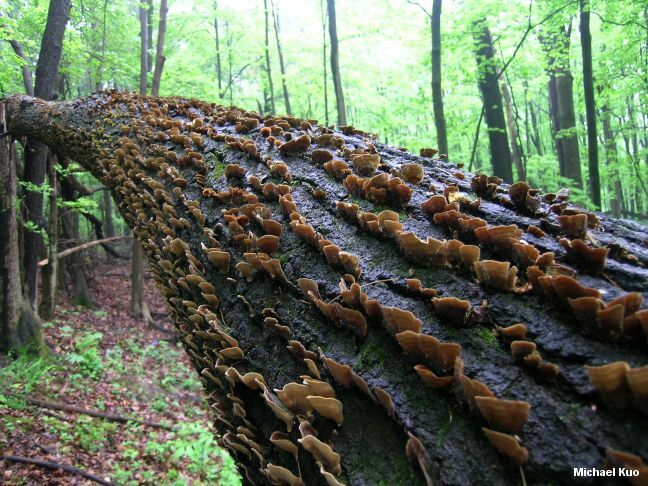 Among the false Turkey Tails, Stereum ostrea is distinguished by its relatively large size (it regularly reaches widths of 5-7 cm) and the fact that it tends to develop individual, sliced-funnel-shaped fruiting bodies, rather than laterally fused flat ones. 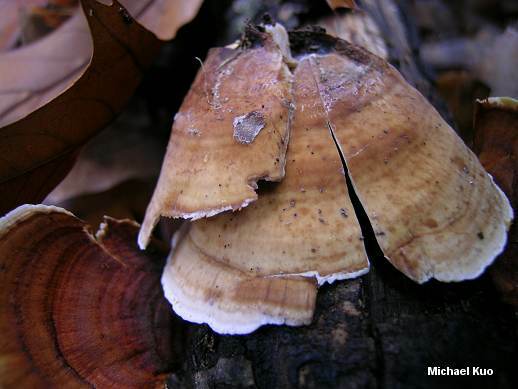 Ecology: Saprobic on the dead wood of hardwoods; growing densely gregariously (but usually individually, without fusing together), often from gaps in the bark; causing a white rot of the heartwood; often serving as a host to algae; sometimes parasitized by jelly fungi; apparently sometimes associated with Phlebia incarnata (see the note on the linked page); spring, summer, fall, and winter; widely distributed in North America. 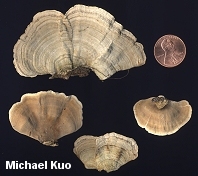 Fruiting Body: 1-7 cm across; usually shaped like a funnel that has been sliced down one side, but often fan-shaped, semicircular, or irregularly kidney-shaped; densely velvety or hairy at first, but often smoother by maturity; with concentric zones of red, orange, yellowish, brown, and buff shades (sometimes developing greenish shades in old age as a result of algae); without a stem. Undersurface: Smooth; whitish to grayish or pale reddish brown. Microscopic Features: Spores 5.5-7.5 x 2-3 µ; smooth; cylindric; amyloid. Pseudoacanthohyphidia (thin-walled elements with 2-5 very small apical projections; true acanthohyphidia have numerous, long projections all over and look like bottle brushes) present. REFERENCES: (Blume & Nees, 1826) Fries, 1838. (Saccardo, 1888; Welden, 1971; Chamuris, 1985; Phillips, 1991/2005; Lincoff, 1992; Metzler & Metzler, 1992; Horn, Kay & Abel, 1993; Barron, 1999; Roody, 2003; McNeil, 2006; Miller & Miller, 2006; Binion et al., 2008.) Herb. Kuo 09300402, 10270402, 11210402, 04270701, 05050705.